Now, before you remind me exactly how difficult the newborn phase is, believe me, I know! But since we're almost past the toddler phase in our house, I've been thinking about how some things were actually easier when Little Dude was a baby. I do love the toddler years too, but it's been a demanding stage. There have been power struggles, meltdowns, and separation anxiety - and that's just the tip of the iceberg. So, let me tell you about the things that are actually better about newborns than when they become toddlers! 1. They take daytime naps. When my baby took a nap (or blissfully, two!) during the day, it was all I needed to recharge my body and mind. It helped me get everything in order and start over again. And when the day nap ended after two and a half years, it was a big blow to my routine. Even though my son sleeps early now, I am so tired at the end of the day, I could crash at 8 PM! 2. There are no awkward questions. "Why is that man wearing funny clothes?" If you have a toddler, you know exactly what I'm talking about. They have this tendency to say the most awkward things in the loudest of voices, in the most public of places. 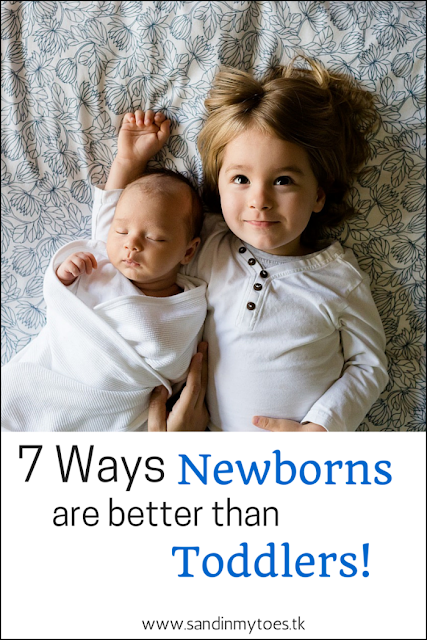 With newborns, the only sounds that come are burping and crying. 3. Babies don't ask for Happy Meals. You can just feed them milk, and you're done. But toddlers not only test your creative skills in cooking, they only want to stuff themselves with junk at the end of the day. You really can't keep up with what they like to eat anyway, so you might as well give in. 4. You can watch something other than Mickey Mouse Clubhouse. It's been a while since I actually saw a television show in peace. With babies, you can at least watch anything and get away with it. With toddlers, you are stuck in an endless loop of screechy sounds and garish visuals. Try watching something else, and you're inviting trouble (see point 2). 5. Potty training is light years away. I didn't like it then, but endlessly changing diapers is still easier compared to the commando level of nerves you need for potty training. By far, it's the most daunting thing I've done as a parent, and I'm not even sure we're out of the woods yet. 6. You don't have to endure playground politics. Those were blissful days when I didn't have to worry about hanging out with the 'right' bunch of moms, avoiding anything that is considered 'bad parenting' (in public, at least), and breaking apart toddler fights. Actually, I steer clear of playground politics even now, by smiling and agreeing with whoever I happen to run into. 7. You can be a mess and get away with it. Of course, you can go shopping with a spit-up shirt on, as long as you have a newborn with you. Nobody expects you to look like the Duchess of Cambridge after giving birth. You don't even need to shower everyday or brush your hair. But when you have a toddler, you're expected to look amazing because you don't have a baby anymore. But. Really? How can you be expected to do anything with constant audience when you're in the shower and when you barely have time to use a face wash? This! I was just saying something similar the other day, babies are so much easier in so many ways! My two year old wears me out way more now than she did then! Very good points raised indeed. Every time I switch on the TV he says "Beebies" and I can't pacify him as he is now smart enough to know that the football is not a new programme on "Beebies"! A newborn also doesn't know the way to places in the car. If I turn left out of our road instead of right, he knows we are not going to the park and kicks up a stink for the next few miles! Yes, my toddler wears me out too! You make some great points there! Love it! I think I totally agree. Especially since I'm about to embark on potty training with a very resistant 3 year old! Oh these points are spot on! My youngest always ask go to McDonalds when we go into town because she knows we will pass it! Then has a fit when we don't stop ha ha! Happens often with us too! Every baby is different, of course! The one thing harder than a toddler is two toddlers!